Our email blast system, VF-Blaster 2.0, is an easy to use email marketing system that can deliver Email Blasts, Events, Postcards, Social Media Marketing, and Surveys to an unlimited number of clients and prospects. As a web-based application, users can access it from anywhere in the world at any time, and with built in scheduling, email broadcasts can be even be sent automatically. Thousands of people can be reached in a matter of seconds, increasing your company's brand awareness and knowledge about the latest news from your company. VF-Blaster 2.0 has a user friendly interface that allows the user to easily drag and drop to customize your homepage. 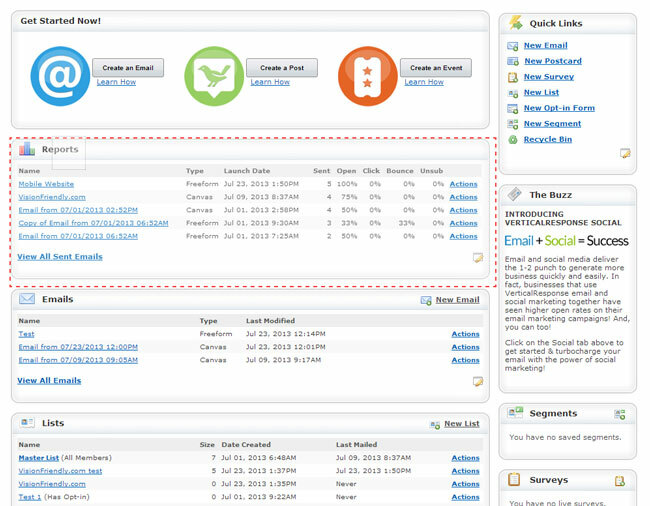 You'll have access to your reports, emails and lists all from the homepage. Below is an example of the Dash Board you will view through VF-Blaster 2.0. VF-Blaster 2.0 allows the user to create several different editor types of Email blasts. The Email Marketing options allow the recipients to forward their emails to a friend, automatically generate a hosted version of the email and allow the recipient to be able to easily share the email on Facebook, Twitter and LinkedIn all from the same page. 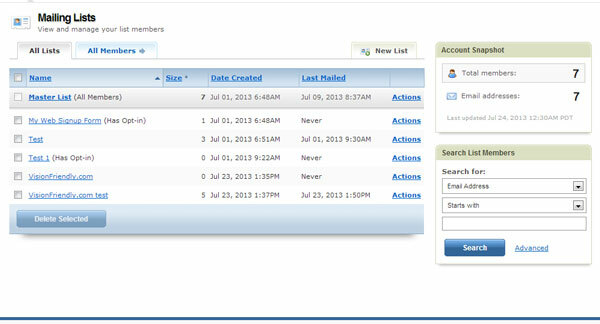 VF-Blaster 2.0 has the ability to categorize contacts and email broadcasts can precisely target specific demographics. VF-Blaster 2.0 allows contacts to be categorized by key date ranges, geographic locations, or by any number of custom categories. Whole mailing lists can be uploaded to the contact database as well as allow visitors to subscribe and unsubscribe themselves online with a simple form. VF-Blaster 2.0 utilizes reporting system that will allow you to track emails that you have sent out and generates a report that shows your opens, bounces, clicks and unsubscribers. After a little analysis of this information, users can learn where, when, and which email marketing campaigns work best for their business. There is a one time set-up fee of $395. The set-up fee is waived for current Boom-er-Rang users that elect to switch to VF-Blaster 2.0. There is a $25 monthly usage charge for up to 1,000 emails per month. Additional mailings are $0.025 per email. There is no charge for contact list importing if you choose to do it yourself. VisionFriendly.com is available to assist with the importing of contacts into VF-Blaster 2.0 for a small fee. For a complete user manual for VF-Blaster 2.0 Click Here. VF-Blaster 2.0 U.S. CAN SPAM Act Compliant. All sent messages should contain email address removal information, as the new legislation requires. We do not tolerate any illegal actions like spamming and mail bombing using our mass mailer. Spamming and sending unsolicited email messages are prohibited by the license agreement.